"Lawmaker Seeks White House E-Mail Report," by Pete Yost, Associated Press, in Washington Post, Aug. 30, 2007. Washington DC, September 5, 2007 - The National Security Archive today sued the White House seeking the recovery and preservation of more than 5 million White House e-mail messages that were apparently deleted from White House computers between March 2003 and October 2005. The lawsuit filed this morning in U.S. District Court for the District of Columbia names as defendants the Executive Office of the President and its components that are subject to the Federal Records Act, including the White House Office of Administration (OA), and the National Archives and Records Administration (which is responsible for long-term preservation of federal and presidential records), under the records laws and the Administrative Procedure Act. 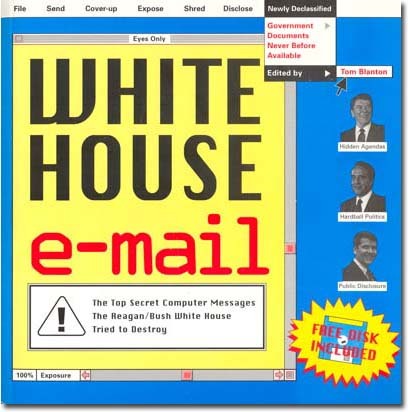 White House officials ranging from spokesperson Dana Perino to counsel Keith Roberts have acknowledged in press and Congressional briefings that e-mail is missing from the White House archive, and that the EOP in 2002 abandoned the electronic records management system put in place by the Clinton White House. Whistleblowers cited in conjunction with a Freedom of Information Act lawsuit brought by the watchdog group Citizens for Responsibility and Ethics in Washington (CREW) have alleged that more than 5 million e-mail messages are missing from the White House servers. "The Bush White House broke the law and erased our history by deleting those e-mail messages," said National Security Archive director Tom Blanton. "The period of the missing email starts with the invasion of Iraq and runs through the aftermath of Hurricane Katrina." Archive general counsel Meredith Fuchs said, "Without court oversight, there's no guarantee the White House will ever recover the missing e-mails or install an effective archiving system." "The law is clear that e-mails count as government records," said attorney Sheila Shadmand of the law firm Jones Day, which is representing the Archive. "The White House admits e-mails are missing but we have no assurance they are fixing the problem." The National Security Archive, an independent non-governmental organization based at George Washington University, brought the original White House e-mail lawsuit (which included a wide range of scholarly, library and public interest co-plaintiffs) against Presidents Ronald Reagan, George H. W. Bush, and Bill Clinton. That lawsuit produced landmark rulings in the early 1990s that e-mail had to be treated as government records. Those rulings led to the preservation of more than 30 million White House e-mail messages from the 1980s and 1990s.